Swipely aims to turn people's purchases into an online conversation by merging shopping with sharing. Angus Davis is banking on the notion that shoppers are comfortable with their online friends knowing what they buy. Davis -- co-founder of speech recognition platform Tellme -- founded Swipely in 2009 to create a real, more interactive social experience around shopping. 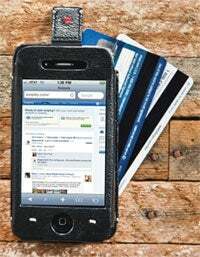 When users swipe their credit or debit card, the transaction shows up on the site for the community to discuss. The site went live last August and already has thousands of members and hundreds of thousands of dollars worth of swipes logged, Davis says. "Our vision is to reinvent how people shop," he says. "It's a secure platform for consumers to recommend purchases, discover new places and products, save money and have more fun shopping." Despite its broad consumer focus, Swipely doesn't make money from users. "We make money from the businesses that people frequent," Davis says. "Using the analytics we track on the site, we work with businesses to implement loyalty programs and special offers for a very targeted set of customers." Because 95 percent of consumer spending happens off-line, Davis says he sees a huge opportunity to help brick-and-mortar merchants tie online marketing to in-person purchase conversion. Users' purchases show up on Swipely. Their friends see a transaction, click through to the retail website and can make a purchase of their own. Swipely takes a cut of that purchase. The Providence, R.I., company has raised $8.5 million in funding from angel investment and a Series A round led by Index Ventures, First Round Capital and Greylock Partners. Swipely users can sign in with their Facebook account, and swipes can be seamlessly shared on Twitter and Facebook. Members can use the handy friend finder to locate people in their networks (Gmail, Yahoo, Facebook, etc.) who are already on Swipely and join conversations by "liking" a swipe, commenting on it or adding it to a wish list. Users then can add a credit card and start sharing their swipes on the site. "The people that are talking now on sites like Yelp and Citysearch are just the public at large," Davis says. "Over time, everyone reviews everything and it looks like all restaurants have three and a half stars. What you really care about is the preferences of people like you -- your friends."